Celtics' Kyrie Irving in on Team LeBron. Davis told the Pelicans he wanted a trade, and James has made it clear that he’d love to play with him. But the Pelicans kept Davis as the trade deadline passed, so for now, their time as teammates will be limited to All-Star weekend and James pounced at the chance to grab him with the second pick of the reserve round. “I’m very sure of that,” James said, when asked by TNT host Ernie Johnson if he was sure he wanted Davis as a teammate. “Isn’t that tampering?” Antetokounmpo asked. Responded James, as both players laughed: “Tampering rules do not apply on All-Star weekend,” a thinly veiled reference to the reaction James got when he listed Davis as one of many players he would like the chance to play with. James chose Golden State’s Kevin Durant with the No. 1 overall pick, as he did last year in the All-Star draft, to be one of his starters. They’ll be joined in the Team LeBron starting five by Boston’s Kyrie Irving, Toronto’s Kawhi Leonard and Houston’s James Harden. Team Giannis, in addition to Antetokounmpo, will start Golden State’s Stephen Curry, Philadelphia’s Joel Embiid, Oklahoma City’s Paul George and Charlotte hometown favorite Kemba Walker. 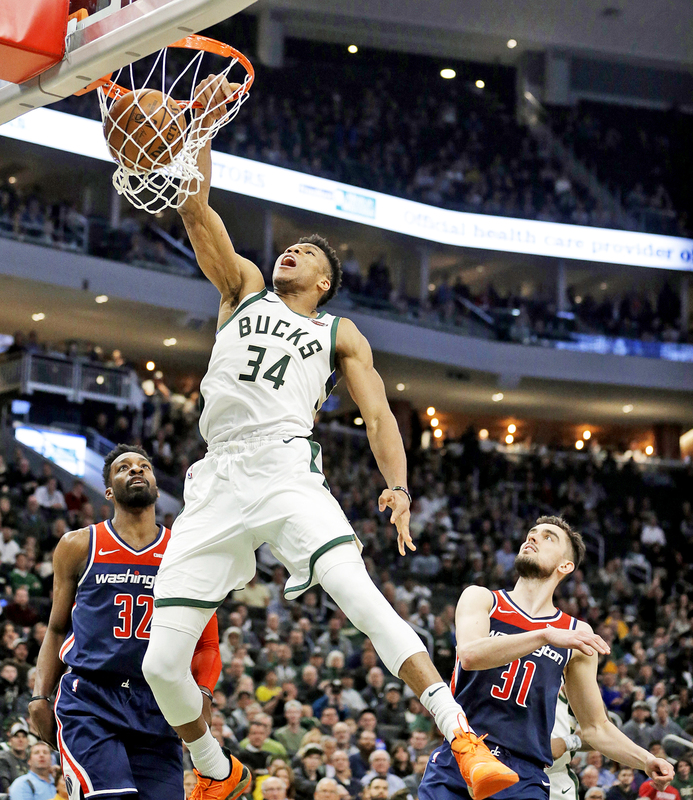 Antetokounmpo said he took George for one reason: “He had a huge dunk on me,” Antetokounmpo said, tipping his cap to the slam that the Thunder star threw down last month. Antetokounmpo took his Milwaukee teammate Khris Middleton with the first pick in the reserve round, along with Denver’s Nikola Jokic, Philadelphia’s Ben Simmons, Detroit’s Blake Griffin, Brooklyn’s D’Angelo Russell, Orlando’s Nikola Vucevic and Toronto’s Kyle Lowry. James took Davis, Golden State’s Klay Thompson, Portland’s Damian Lillard, Oklahoma City’s Russell Westbrook, San Antonio’s LaMarcus Aldridge, Minnesota’s Karl-Anthony Towns and Washington’s Bradley Beal. “Pop is going to tell me I can only play him two minutes,” James said, likely only half-seriously. James managed to make a trade, convincing Antetokounmpo to swap Westbrook for Simmons — and give the Bucks’ star the chance to have Westbrook and Embiid together, as he said he wanted. The NBA signed off on the trade. That left the third round and the decision between the two special additions to the game by NBA Commissioner Adam Silver — those being Miami’s Dwyane Wade and Dallas’ Dirk Nowitzki. James took Wade, his former Miami and Cleveland teammate and longtime close friend. That left Nowitzki for Antetokounmpo’s side. “I didn’t have to lobby for it,” Wade said. It was the second year of the captain’s-choice format. James and Curry were the captains last year, but the order of their picks were not revealed or aired. Milwaukee’s Mike Budenholzer will coach Team Giannis, his second time leading an All-Star team. Denver coach Michael Malone will make his All-Star debut, coaching Team LeBron.